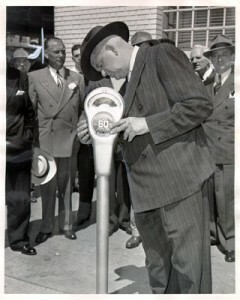 San Francisco Mayor Roger Lapham in 1947, testing the city's first parking meter. The city is now taking its parking system into the 21st century. If you drive to do business in a heavily traveled urban area, chances are you’ll get caught up in a search for parking. You know the drill. You circle a block several times, slowing down whenever you catch a glimpse of someone who might be opening up a space. Your hopes rise as a woman walks toward her car, but then she opens her trunk, throws in a package, and walks away to do more shopping or business. You drive on, finding a spot only much later. Meanwhile, a few blocks away, there are plenty of spots, but there’s no good way for you to know that. Now, a few cities are tackling the problem, using an array of wirelessly connected sensors and computer systems to keep track of empty spaces. The systems allow cities to raise or lower parking meter prices in order to make parking more efficient. The goal of these pricing adjustments is to have, most of the time, at least one parking space available on every block. Plus, longer time limits and new meters that accept credit and debit cards will make it easier to avoid parking tickets. Drivers find out about empty spaces and the price they’ll pay through smartphone apps. They also can pay for parking directly through their phones. In this way, traffic is distributed more evenly, there are fewer bottlenecks caused by people searching for spots, and revenue is maximized for a city. That’s important, because parking is often a city’s second or third largest source of revenue. San Francisco is a pioneer in this new system. The city has integrated 7,000 parking spaces into its initial launch of the system, which was funded through a grant from the U.S. Department of Transportation. If you want to learn more, check out this story on the Atlantic Cities website. Streetline, the company that makes the equipment to power the system, also is working on pilot projects with Boston, Fort Worth, New York, Indianapolis and Washington, D.C. This month, Streetline will launch a Los Angeles system, and it will be even larger than the San Francisco effort. If we’re going to keep our cars and avoid never-ending gridlock, systems like these will be a must in the 21st century. It won’t be long before they’ll be in every major metropolitan area. This entry was posted in Society and tagged cities, intelligent parking. Bookmark the permalink.